...that includes all of the basics and more! Surely not?! With AJ&Smarts experience of over 200 design sprints, they've managed to bring us this ingenious update. With multitasking a necessity today, windows feel outdated. If you always uses apps in full screen, you'll know the struggle of having to swipe, swipe, swipe to find the app you're looking for. So, what's the solution? Mercari's brand is known and recognised in Japan. But the transfer to UK market wasn't so smooth. With words like "bland", "tired", "confusing" and "middle-aged" being thrown around, it was time for an update. Type — only as powerful as the words it displays? Or much more than a mere vessel for written copy? Font is a choice we make every day, so we should be conscious of the feelings and sentiments it conveys. Ran out of space? Can't read your own handwriting? I feel you, whiteboarding is hard! Use these two simple techniques, and become a whiteboard pro, impressing clients and colleagues with your notes and diagrams. 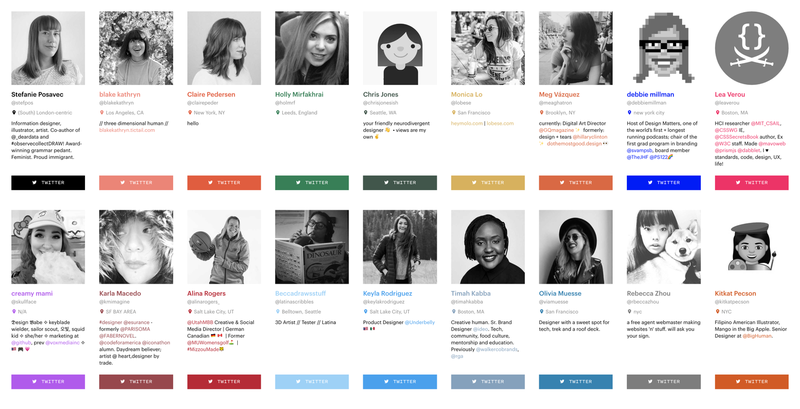 A Twitter directory of accomplished women in the design industry. Feel like you're following too many straight, white men? Use this project to follow new women and diversify the voices in your feed!